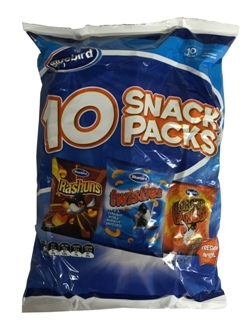 Mixed variety pack of 10 snack-sized Bluebird cheese flavoured chips. Contains Gluten, contains Milk or Milk products. Contains Soybeans or Soybean products. Corn, Palm Oil, Wheat Flour, Hydrolysed Vegetable Protein (Wheat, Soy), Sugar, Whey Powder (Milk), Salt, Flavours (Soy, Milk), Maltodextrin, Food Acids (Citric Acid, Sodium Diacetate), Rice Bran, Mineral Salt (Potassium Chloride), Spices (Paprika, Cayenne Pepper), Emulsifier (E471), Milk Powder, Garlic Powder, Colours (E102, E110, E155). Food Colour(s) E110, E102 may have an adverse effect on activity and attention in children.